March 8, 2016, Central Saanich, BC (ISN) – The Boulders Climbing Gym in Central Saanich is pleased to announce that it will be hosting a Climbing Escalade Canada (CEC) National Series lead and speed climbing competition on Saturday March 12, 2016 at their world-class climbing facility in Central Saanich. 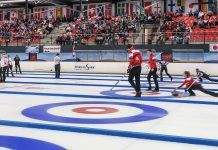 The event is the first CEC National Series event of the competition season in the lead category and the second and final in the speed category, following an event in February in Montreal. Additional National Series lead competitions will also take place in LaPrairie, Quebec (March 19-20), Toronto, Ontario (April 23-24) and Edmonton, Alberta (May 7-8) and will culminate in the lead Youth and Open National Championships that will be held in Canmore, Alberta (May 28-29). Saturday’s event also marks the first of two major climbing competitions that will be held at The Boulders this spring, with the CEC Youth and Open Speed National Championships to follow on April 9, 2016. Saturday’s competition is also sanctioned by Sport Climbing BC (SCBC) and will feature some of the best youth and open lead and speed climbers from across the country competing in a range of age categories including four separate Youth categories, Junior, and Open. There will also be competition in a number of non-sanctioned categories for all ages and abilities. The CEC National Series Event on Saturday will see both lead and speed competitions running concurrently at some points. The speed competition begins with the Open (Youth A and Junior), Masters and Experienced categories from 9:00 to 11:00 am, while the Youth B,C, D and Recreational age groups run from 12:30 to 2:30 pm. Awards for the speed competition are scheduled for 3:00 pm. In the lead competition, qualifying rounds in the Youth B, C, D and Recreational categories run from 9:30 am to 12 Noon, with the Open, Masters and Experienced categories running from 11:30 am to 2:30 pm. Lead finals in all age groups will run from 4:30 to 7:00 pm with awards to follow immediately thereafter. Registration is still open for climbers who want to enter and will stay open until March 10, 2016. The fee is $70 plus HST for both disciplines, or $60 plus GST for one discipline and climbers can register and find more details at https://www.sportclimbingbc.ca/event.php?cpid=39. The Boulders Climbing Gym is a not-for-profit society, with the mandate of making climbing accessible for everyone, regardless of ability or ability to pay. With over 13,000 square feet (1,208 square metres) of climbing space, The Boulders Climbing Gym is a community facility and a unique social enterprise, providing adaptive recreation and rehabilitation programs, youth recreational and competitive programs, as well as facilitating a climbing academy at Stelly’s Secondary School. All instructors are certified by the Association of Canadian Mountain Guides. See www.climbtheboulders.com for more details. Sport Climbing British Columbia (SCBC) is the provincial governing body of competition climbing in BC. SCBC promotes and sanctions Sport, Bouldering and Speed climbing competitions. We are a volunteer based non-profit organization working together to make competition climbing in BC the best it can be for our athletes. See http://www.sportclimbingbc.ca for more details.